We are now well into our travelling routine. An early morning walk with the dogs, not too long, about a couple of miles, as Dexter is always keen to get back for his breakfast. Then a few of hours work, followed by an afternoon’s walking. The location for today’s walk is another trek that I have wanted to do for many years. 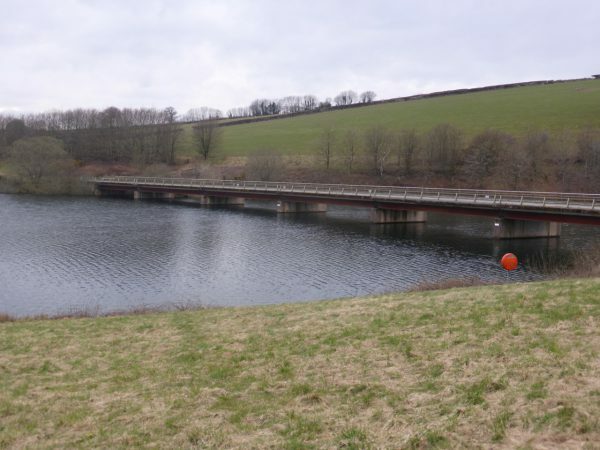 When I worked in Taunton in the early 1990’s I had a colleague who used to rave about the walk around Wimbleball Lake. So today we will find out if it as good as I was led to believe. We start from the main car park at the lake. With the threat of rain later, Lynnie likes the idea of visiting the Café whilst I walk. But is persuaded to join the dogs and I for what should be a pleasant stroll. First she picks up a leaflet in the shop showing the various trails. We are going all the way around so it should be straightforward. We decide to walk in a clockwise direction around the lake. For the first half-mile or so we bump into people but by the time we reach Bessom Bridge there is hardly anyone around. We decide to take a short diversion to follow a route in the leaflet through Hurscombe Nature Reserve. This leads around the northern most tip of the lake. 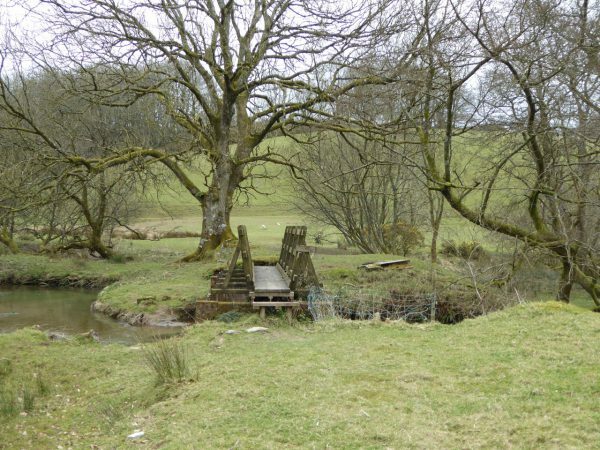 We follow footpath signs and then after about a mile we cross a stream and find the route on our leaflet does not correspond with the way-markers. However, there is clear evidence that others have walked and ridden bikes on this side so we follow the route that they have taken. This soon peters out and without any clear indication of where we should pick up the path we decide to retrace our steps to Bessom Bridge. The diversion has been slightly frustrating; as we walk back we can see people on the path on the other side of the valley but still have no idea how they got there. After going over Bessom Bridge we turn right at Bessom Cross and then go over the causeway to pick up the lakeside trail on our right. Now it is just a case of keeping the lake on our right and following the well-defined path. The odd section is a bit boggy but easy enough to negotiate. The lake is absolutely still and it is very tranquil as we stride out. Lakes of this size usually have deep inlets, following them adds time and distance to the journey, they also provide many different perspectives and views. The downside is that lakes tend to take longer to walk around than you first imagined. 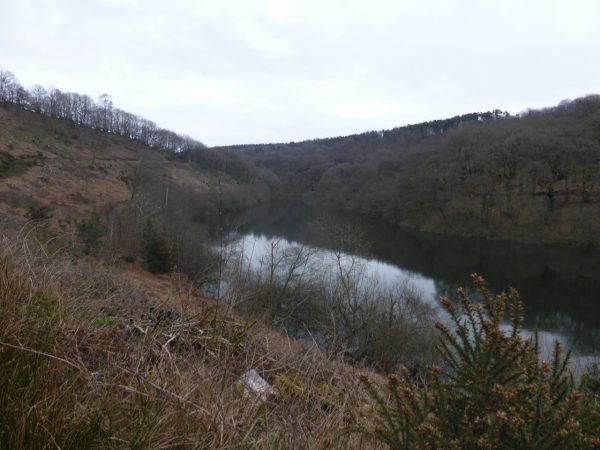 The walk so far has been in the open, but then we enter West Hill Wood and the path climbs away from the lake before turning into another inlet through what would have been South Hill Wood, had the trees not been felled. Above us is Upton Farm, later when I am talking to Mary the owner of our site at Plymptons Farm she tells me how her father-in-law had this farm before the lake was created. During the process of flooding the valley he lost land and there were barns which are now under water. She told me that her brother-in-law still continues to farm here. At the end of the inlet we take a path besides the lake, this is narrow and a bit difficult in parts, but we press on below the woods of Upton Cleave. Eventually the boggy ground gets to us and when an opportunity arises, we go through a gate and pick up a wider track through the woods. 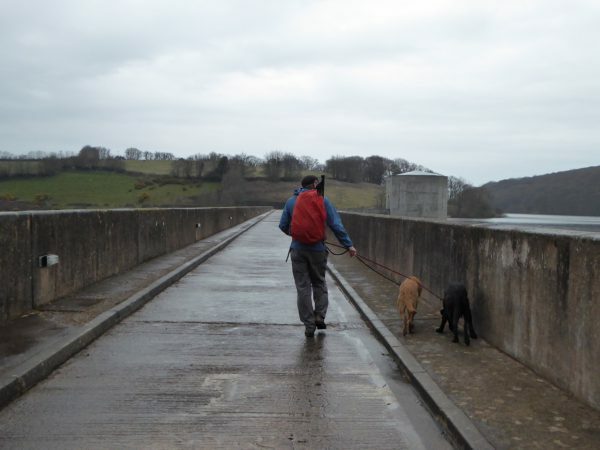 Meeting a tarmac lane we turn right down to the reservoir dam. I am okay looking back to the lake, but when I take a glimpse over the wall to the valley below by legs go wobbly. With tunnel vision I press on to the other side whilst Lynnie stops to take photographs. 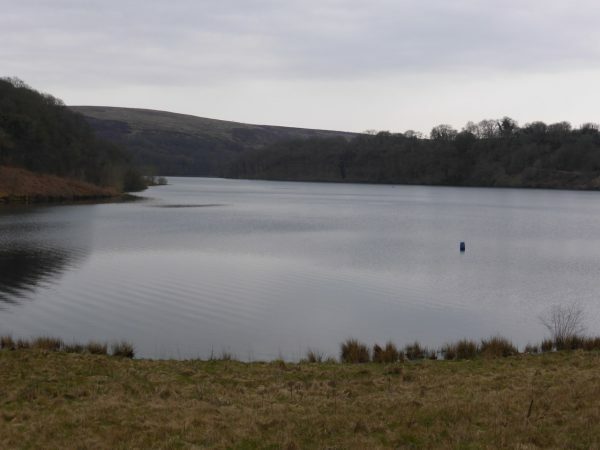 The information board states that the reservoir was created by damming the River Haddeo. 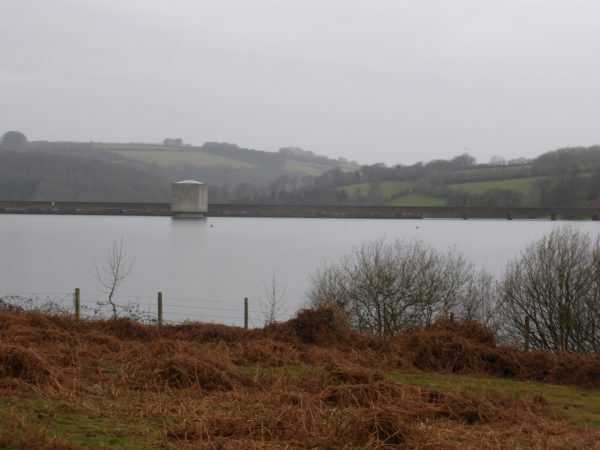 The work commenced in November 1974 and the lake first provided a water supply in 1978. 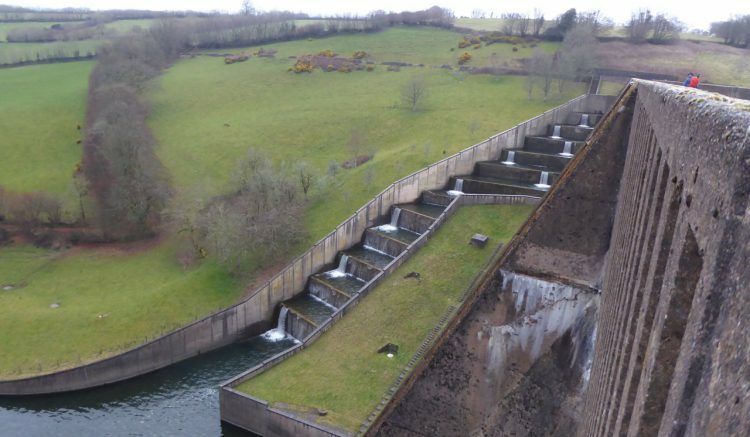 It took a further two years for the water to first flow over the spillway. 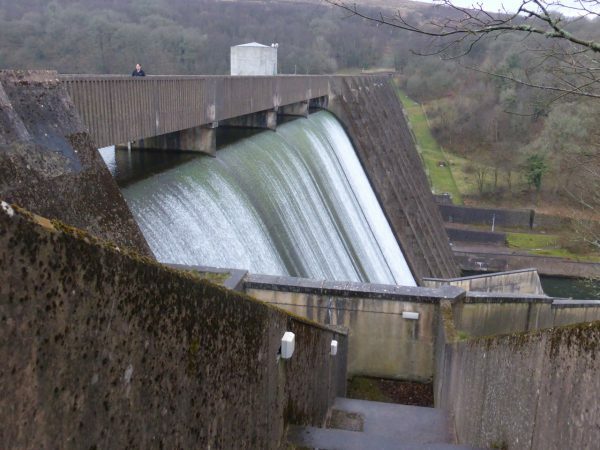 The dam itself is an impressive structure, 300 metres across and standing 50 metres high. There are three different levels at which drinking water is extracted. The whole lake holds 21,320 megalitres of water. 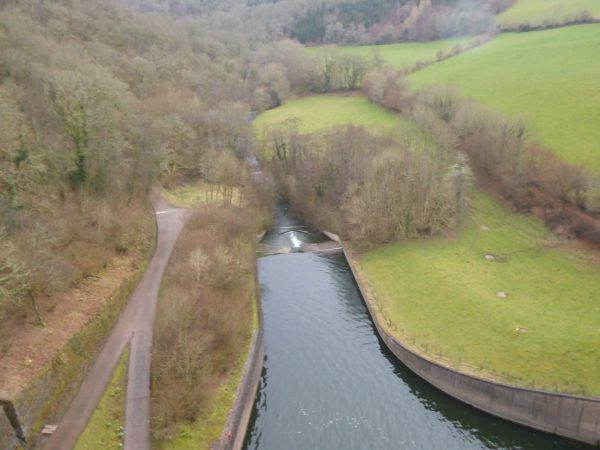 From the dam it is a further 1.5 miles back to the main car park. By the time we arrive all the other cars have departed. 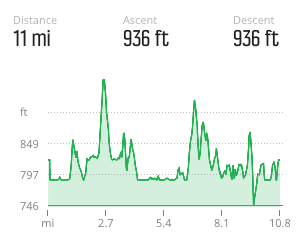 My Suunto Traverse shows that we have covered almost eleven miles. Lynnie feels that she deserves a cup of tea, however, the café closed long ago so she will have to wait until we get back to the Coachman!